Police said a haversack containing AK-47 assault rifle and several rounds of a variety of ammunition was found Friday evening in a clump of bushes in north-western Georgetown. 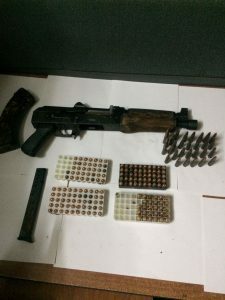 The AK-47 assault rifle and an assortment of ammunition that police said they found in a clump of bushes in Kingston, Georgetown. The Guyana Police Force said lawmen received information and went to a bushy area in Kingston at about 6:30 PM when they found the high-powered rifle and numerous rounds of ammunition. The items included an extended .380 magazine and 196 live rounds of 7.62 by 39,. 40 and. 380 ammunition. No arrest made. Investigation in progress. Previous: 14 persons hurt after minibus slams into tractor trailer – driver was allegedly drunk at the time.